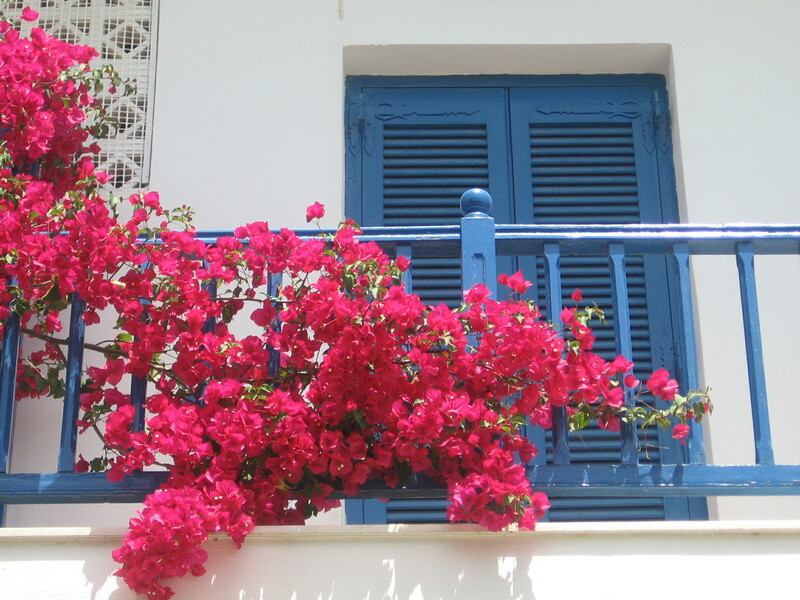 Bougainvillea bushes, blue shutters, white houses, azure sea, clear waters, sand and pebble beaches, hidden coves, coastal trails, fresh grilled calamari, friendly people, narrow roads, flowers in bloom….ah-h-h-h-h……Paros Island, Greece. Buses roll over roads transporting locals and tourists to various towns, artist workshops sprinkle hills, 200-year-old rock walls mark the boundaries of fallow and tilled fields, dirt roads flanked by vineyards and olive trees lead to houses — these are some of the sites on the 64 square miles of Paros Island, Greece. Life is simple on the island. Crops are grown for local consumption, goats’ milk produce local cheeses, cattle and sheep graze the hills, vegetables gardens are plentiful, artisans paint, write and sculpt. Some landowners have sold to developers, made millions and moved away. Others, the cycle of life goes on with new generations living on their centuries old family’s soil. Athens is “over there” someplace, and here, the weather is a main topic of conversation. Coves are tucked in the coast with small patches of sand inviting a sunbather. The beaches are awesome. 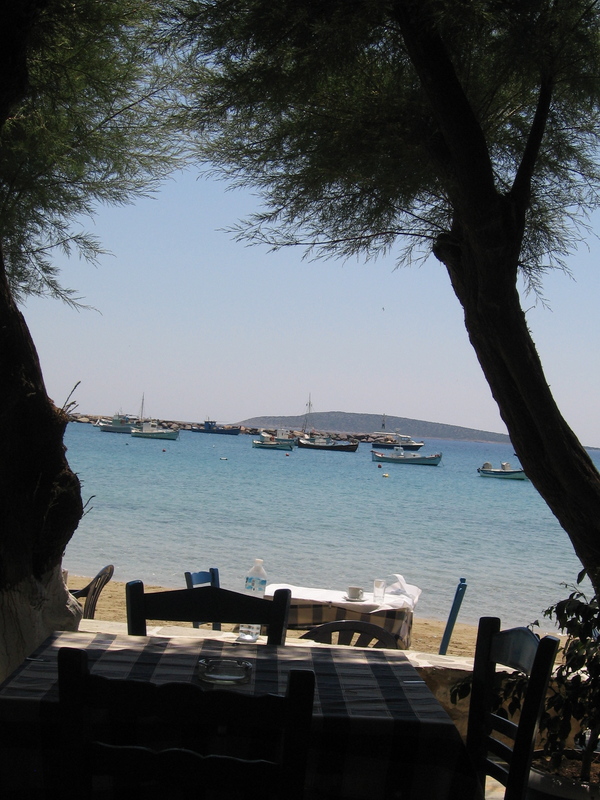 Some are sandy, some are rocky but all meet the Aegean Sea with its hues of blues and soft waves. The sun warms the body and just feels so damn good. 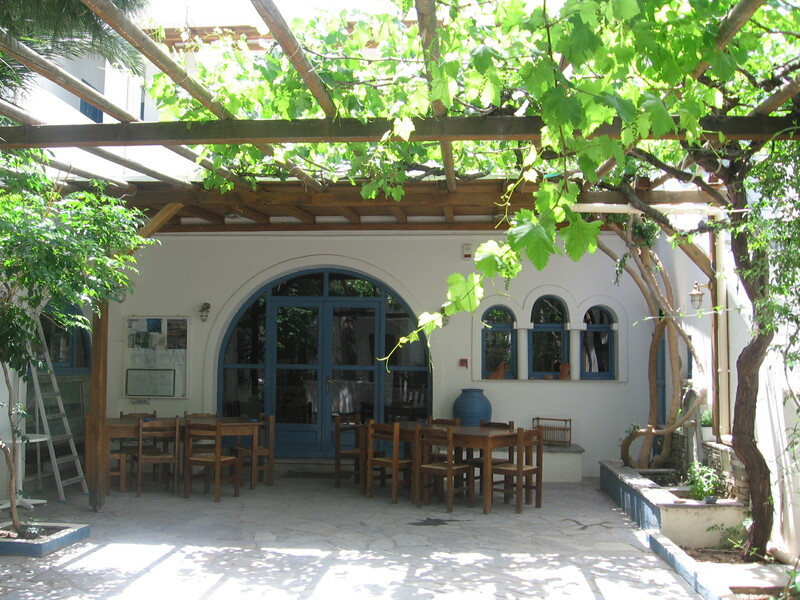 The towns of Parikia and Naoussa are the main tourist centers with all the trappings that go along with the words “tourist towns” but still have a vibrant local community. Lefkes village in the center of the Island was the capital during the Middle Ages. Olive trees cover the hills around the village and its’ 500 inhabitants, cobblestone streets, whitewashed houses and white marble Byzantine church. 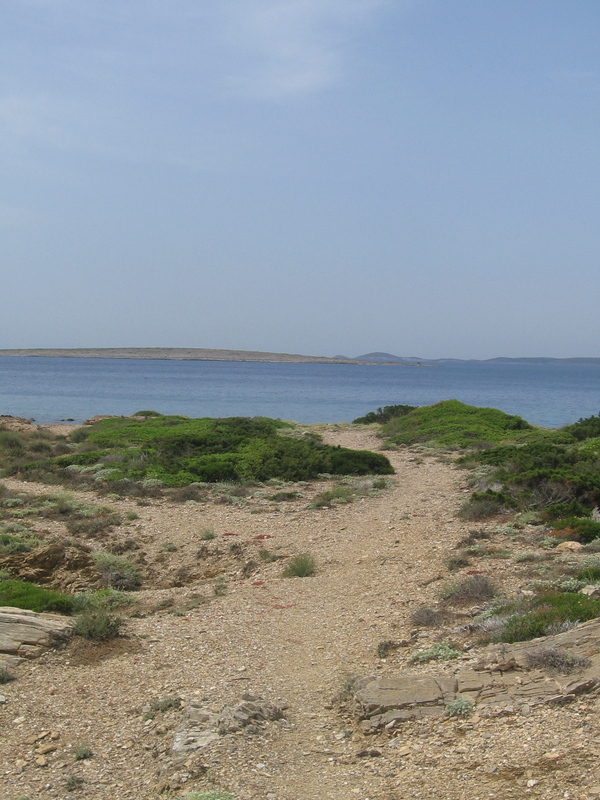 An old paved footpath winds it way from the village to another village and finishes at the sea. 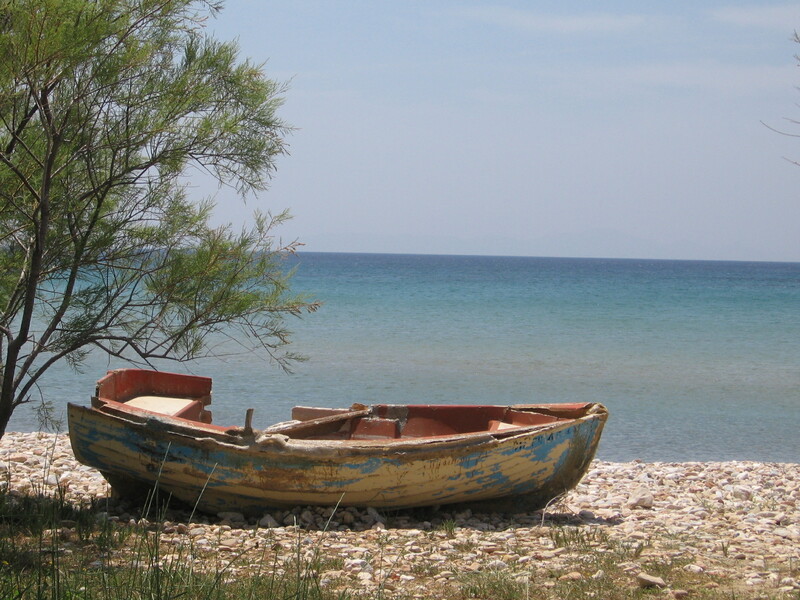 During the month of April, year-round and summer-only residents open their tavernas and shops, construction and painting jobs start, local fisherman prime boats, freshly painted signboard menus appear by the doors of restaurants, and a few summer houses open their shutters and doors. The locals wave “hello’s” or greeted “Kalimera” to their friends who arrive for the three-month tourist season. The small village of Alyki, woke up after winter’s hibernation, and it was my home for 5 weeks. Restaurants and the only tourist shop were beginning to open when the taxi dropped me off, and the beaches had few footprints on them. The coastal paths bordered by rocks, sea and spring flowers welcomed me as their only visitor. Greek was the main language spoken at the restaurants. As time progressed, my ears received a refresher course in French and Italian, and soon UK English floated into the stream. The tourist season began slowly, and now, the weekends are busy. 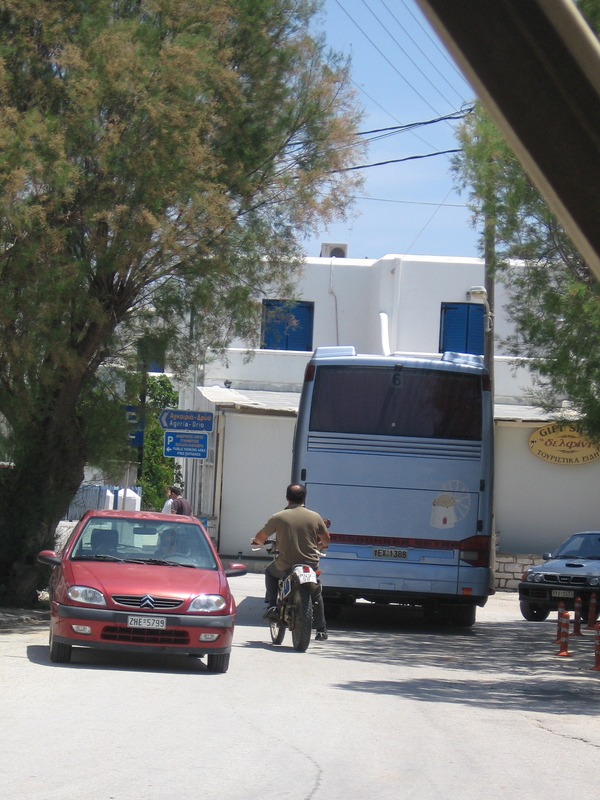 Men with baseball caps and sunglasses drive by on 4 wheel ATVs and the tour buses slowly navigate the narrow street thru town. The once empty beaches are playing host to all shades of red tinted skin on their shores. An additional waitress works the weekend evening shift at the restaurant next to the coffee shop. Memories of being the only guest at the hotel for the first few days bring a smile. I am sitting in a coffee shop, now, watching people with really white legs clad with Bermuda shorts and black socks in sandals walk down the narrow street in what can only be described as “the tourist stroll”. No attention is given to who or what is behind them – this flock of strollers has caused a car to slow down to 1 mph with the driver tapping his thumb on the steering wheel. Would you please look behind you ….and… A woman looks behind her, out comes “OH DEAR, we had better move over…” and the group backs up in a long line to allow passage for the car. Can they make it any more difficult to get out-of-the-way? Tourist “line dancing”, I guess. Sounds crotchety, doesn’t it? Selfish of me, the quiet village town is entering the season. I imagine, towards the end of September, smiles will be thin, and the locals will probably be glad the season is over. 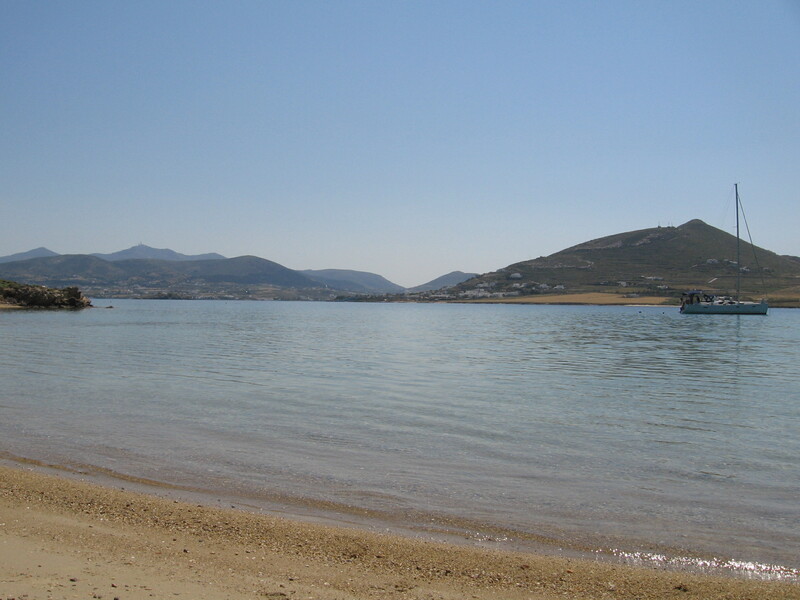 Windsurfing and diving schools close, the beach tavernas close their shutters, fewer buses will travel the roads and the summer vacation homes will be winterized and vacant. The lady at the bakery will speak her native Greek to 99% of the clientage and greet them all by their first names. The markets reduce their inventory and day-to-day life resumes – school, kids, cooking, TV and going to Parikia once a week to do errands. Money will have been made to help tide everyone over until the next June comes along. The population on the island will drop to 18,000 +/- local inhabitants. I will say good-bye to Mr. Costa and Maria who tried desperately to teach me some Greek(absolutely NO success) while I ate lunch at their restaurant, order a cappuccino from Marianna for the last time before departing, and pet the four kittens whose eyes opened during my stay. The trail along the coast with flowers in bloom and views of sailboats in the Aegean Sea will be disturbed one more time before I board the ferry tomorrow to Santorini. 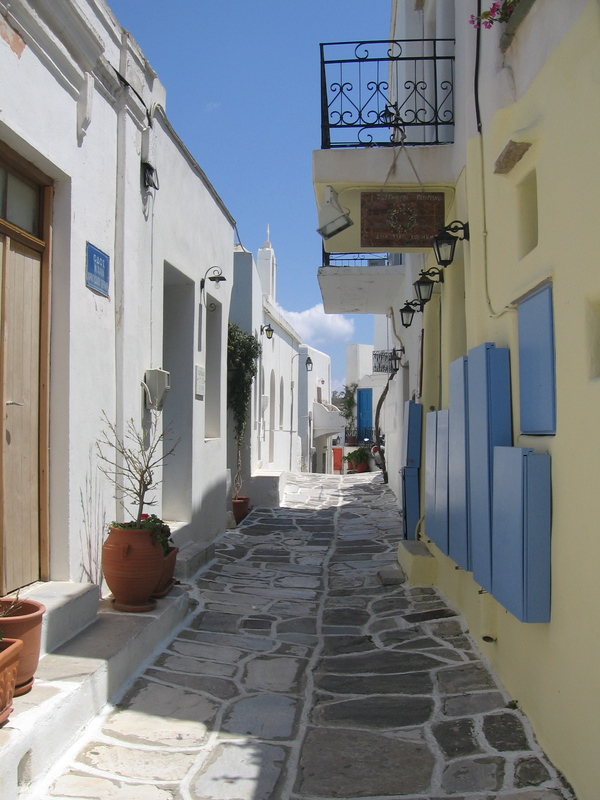 I shall miss this little fishing village where I felt complimented when some of the locals started saying “Kalimera, Lisa.” Maybe next year……? p.s. remember to “elongate your spine from the tailbone to the crown of your head” OK? Love your descriptions. What a wonderful reprieve you’ve had. Where to next? 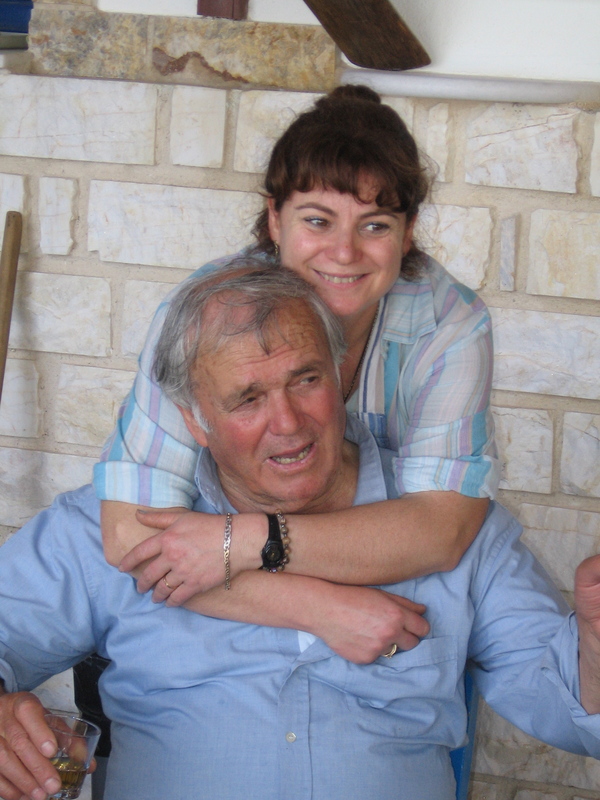 Always insipiring – your pics, writings and selection of destination. Where to, next? You certainly take good pictures – I am so envious of you that you went there. Hope to see you back in the US or maybe we meet up again someother parts of the world 🙂 !